It’s “coming soon” to Adult Swim. 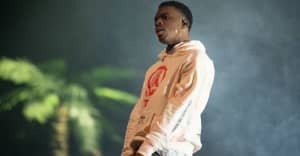 Carl Jones, a producer of Adult Swim's The Boondocks, has hinted at a new cartoon for the network featuring Vince Staples, D.R.A.M., and more. “New T👀N Coming Soon,” Jones wrote in the caption for the post, which featured the faces of Staples, D.R.A.M., and writers Giana Lawrence, Quinta Brunson, and Judnick Maynard. A representative for D.R.A.M. confirmed the artist's involvement in an unspecified Adult Swim show to Pitchfork. The site also pointed out a seemingly confirming tweet from Adult Swim's Senior Vice President and Creative Director of On-Air Jason DeMarco, who tweeted “HELL yeah!” in response to Jones's post. Representatives for Vince Staples were not immediately available for comment.